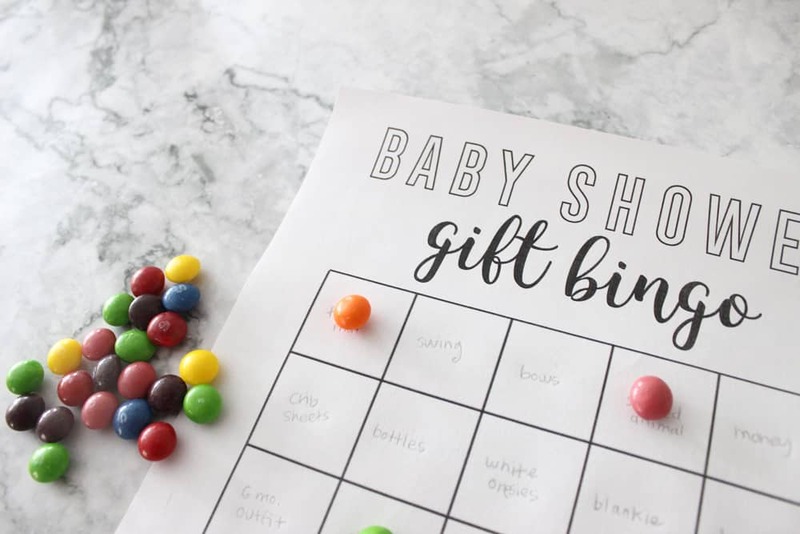 If you are looking for easy baby shower games this baby shower bingo is perfect! Hello friends! 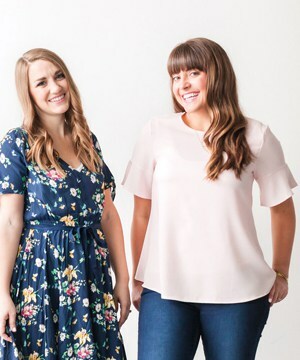 We love almost nothing more than throwing baby showers for our friends and loved ones! 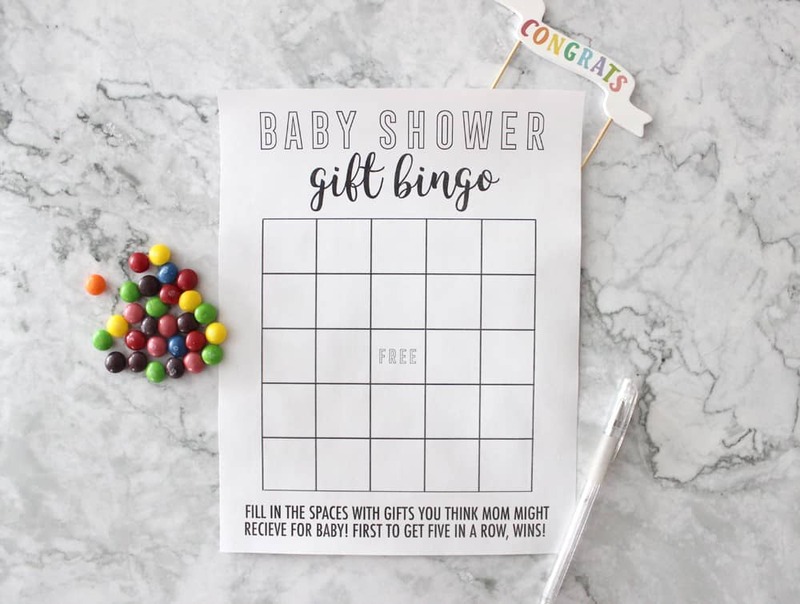 I know throwing a baby shower and finding easy baby shower games can feel stressful, but with our new printable baby shower bingo your party planning just got a lot easier! If you are stressed out about decorations, favors, or food be sure to check out our post on how to throw an amazing baby shower on a budget! 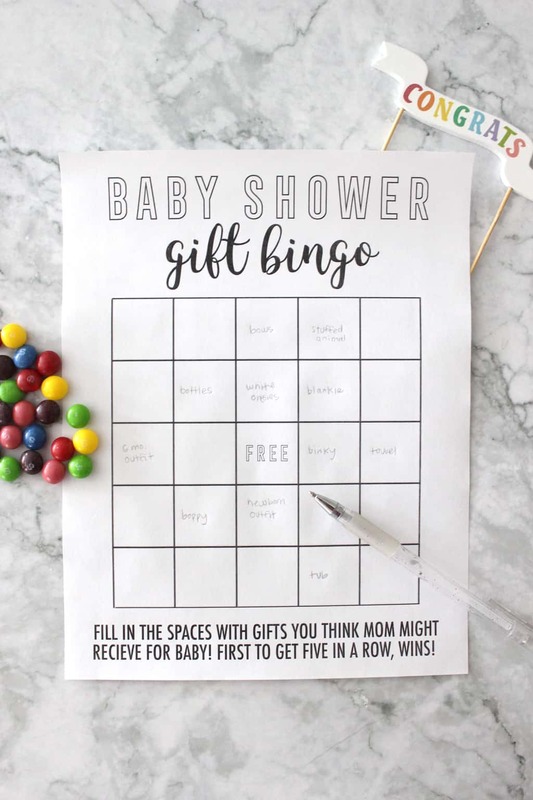 Baby shower gift bingo is a little different then regular baby shower bingo because guests fill in the squares themselves with items they think the mama to be might receive when opening her gifts. Feel free to write items in multiple spaces (ie: onesies more than once). When the baby mama opens a gift you have written down cover it with a candy, or if you opt out of using markers put an x through your square with your pen or pencil. If no one gets bingo when the mama is done opening her gifts then whoever has the most squares covered wins! The goal is to cover 5 squares in a horizontal, vertical or diagonal row. After someone wins, you can still keep playing! To do so, all players will clear their cards off and the caller can start again. To print at home: Click this link, and download the file. In the right hand corner of the download window, you should see a ‘print’ option. To print at a copy store: Download the PDF file and save it to your desktop. Upload the PDF to the copy store’s website. (I like to do this at FedEx Office.) Choose how many copies you want, and complete your order. 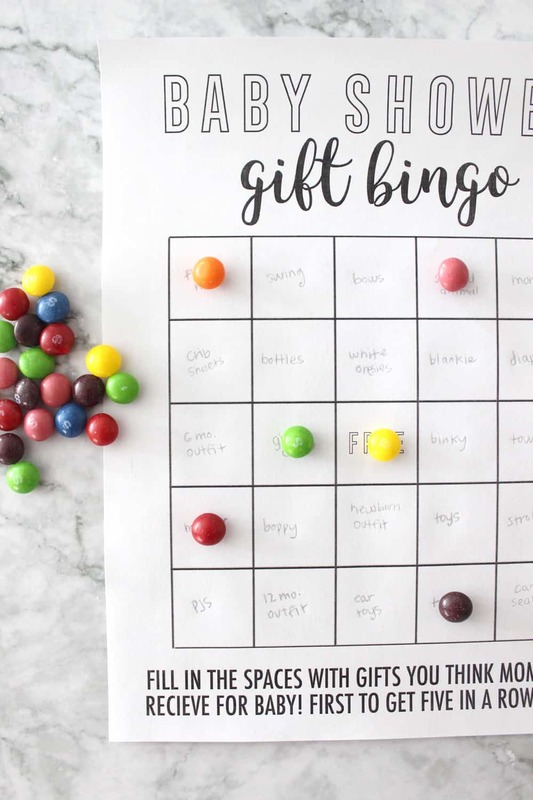 Our free printable bingo cards work best printed on a light card stock, but you can use regular printer paper too if you don’t want to fuss with card stock. We recommend laminating your cards, so that they stay free of dirt and wrinkles. This way, you can use them again and again! If you need more awesome baby shower ideas check out some of our other easy baby shower games! Nothing is better than a fresh new babe sent from heaven! Happy baby showering friends, I hope this baby shower bingo helps your party thrive!